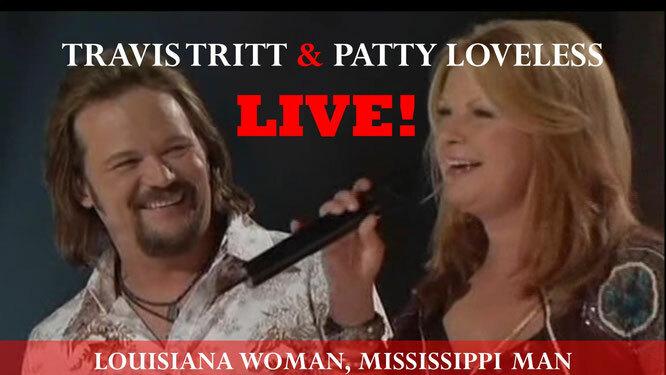 Travis Tritt & Patty Loveless - Louisiana Woman, Mississippi Man! (2005) Full Screen. Best Quality. - Newhillbilly website. 100% American Roots Music. "Louisiana Woman, Mississippi Man" was released in May 1973 as the first single and title track from the album of the same name. The song was their third number one on the country chart as duo. The single would stay at number one for one week and spend a total of 13 weeks on the country chart. We get together every time we can. There's too much love in the Mississippi heart. Too much love in this Louisiana heart. Sooner or later they know I'm gonna try. It's goodbye fishin' line, see you while ago. Till I was wrapped In the arms of a Mississippi man. Like another hurricane just ripped the coast. That Mississippi River Lord I'm gonna swim. And I'm gotta get me to the other side. Gotta have your loving one more time. Too bad alligatior you swim too slow.